Students - Discovering new planets! I am so excited to present you the cover of this E-publication. Looks like a regular cover, right? But let me tell you that is not. Click on the image to make it bigger and download AURASMA app on your mobile phone. Then, look for my Aurasma account: eblancoh and follow me. Are you ready? Now, just scan the cover and see what happens. Today I would like to show you the collaborative video challenge that I had the opportunity to do with three other teachers who are also creating different E-publications: Marta is creating a E-publication about storytelling, Nora about healthy life and Maria's E-book is about art: Picasso and Velázquez. So we combined this four topics and we came up with a very fun story for our video challenge. In 5302, in another planet called Electron lives Pedro Picasso, a 14 years old teenager and family of the famous Pablo Picasso. All the members of the family have an extraordinary talent but he does not find his own talent, moreover he loves junk food and he is a bit messy. After a very bad day he goes to sleep and he dreams with his great great great father, Pablo Picasso, and Velázquez. They advise him to feel proud of his work because it express what he feels and also, that he should become healthier. This dream makes him realize that he needs a change. So he speaks with his teacher and his mother and starts a new healthier and happy life. To create the images of our video we have used Pixton, a really easy online tool to make comics without having to draw. And to put all the scenes together, we used Kizoa, an online slideshow and video maker that allows you to combine pictures and audio. I really like this two tools and I highly recommend both of them! Would you like to see the result? Here it is! I hope you enjoy watching it! Hello my dear students, today I would like to share with you a collaborative presentation that I made with Nora, a CLIL teacher who is also creating a beautiful E-publication about healthy habits. You can click here to go to her Blog. 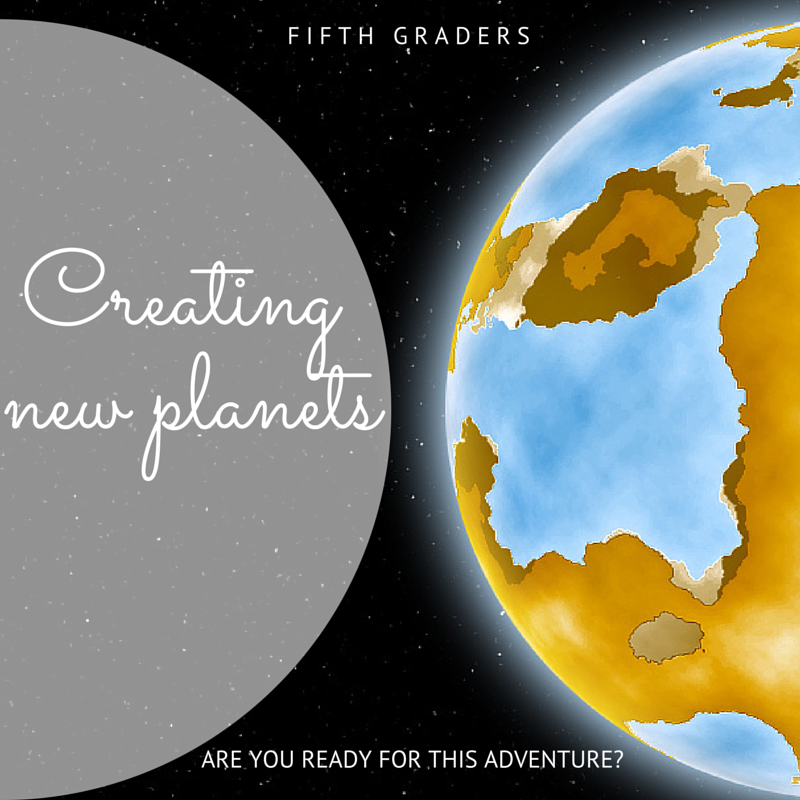 We have created a story to you in order to foster your imagination as you will have to create your own planet soon. It's important that you start thinking about the features you want for your planet and don't you think is a good idea to start thinking on that meanwhile you are creating a beautiful story? We made our story with an online tool called StoryBird. And I should say I totally recommend this tool if you want to create a very lovely stories. The physical appereance is incredibly beautiful. So... Do you dare to create your story? Today I am challenging you to make your own riddles about planets. Listen to the tracks below and create yours. The tool used to make this challenge is Soundcloud, a very intuitive online tool. Looking foward to listening yours! 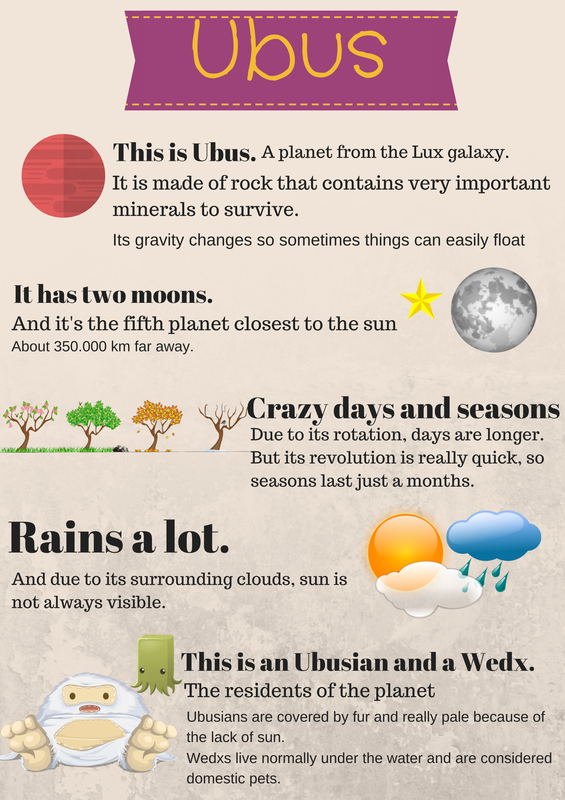 It is time to start thinking about the characteristics of your planet. You should think about the dimensions, the gravity, materials, climate and habitants. You need to look for images (Remember, ALWAYS with Creative Commons) or you can create them yourself. After thinking all the details you need to make a poster summarizing all of them. Make it visually to catch the attention of your peers. To make the poster you can use Canva or another online tool. Remember all the features you need to include and be creative!! All the pictures from the poster are from Pixabay, by OpenClips. Good morning, today's mission is going to be fun! Because create a video is always very fun, right? It is time to present all your classmates the residents of your planet!! Make a presentation video to describe the most important characteristics. You could look for a song that you like it to make add it to your video. Here you can see an example of a video presentation. I made my video using Animoto, that I believe that is a very online tool because you can upload your own pictures. But there are other options, such as PowToon or Kizoa that are also great! Are you ready to create yours? All the pictures from the video are from Pixabay, by OpenClips.